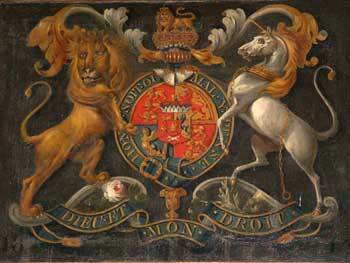 These were painted by William Archer of Foulsham in 1815 to celebrate the victory of Waterloo. He is recorded in contemporary directories and as painter and glazier. He hay have had come considerable reputation in the area for this type of work and he possibly painted among other things armorial bearings on the carriages of local entitled gentlemen. He was buried in Foulsham in 1864 aged 77. The arms of England occupy the first and fourth quarters, Scotland the second and Ireland the third. In the middle there is an inescutcheon for the electorate of Hanover which came to the English crown with George I in 1714 - it is surmounted by an electoral bonnet, which was changed to a crown in 1816 when Hanover was declared a kingdom. Unlike the union with Ireland (1801) and Scotland (1707) Hanover remained a personal possession of the king. Salic law however prevented a woman from ascending the throne of Hanover, so when Victoria became queen in 1837 the arms of Hanover were dropped. 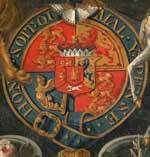 This is the first Royal Arms not to include the fleurs-de-lis of France since 1340 (Edward III), which had been included by the kings of England as a claim to the French throne. This claim was dropped in 1801 by George III and the fleurs-de-lis removed, resulting in the present Royal Arms (without the inescutcheon). On the east wall hangs the dosal. Inspired as it is by early glass and mosaics, the deign represents the Trinity. God the Son sits in majesty with a dove, symbols of the Holy Spirit holding a circle, symbols of God the Father; the whole contained in a Triangle, which is a sign of the Trinity. 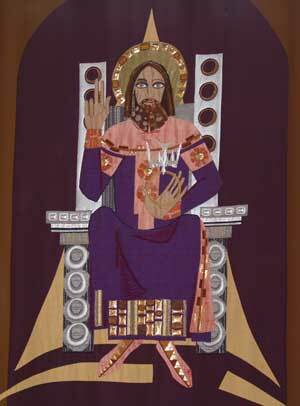 The background includes a purple Norman arch which relates the design to the priory building, and choir stalls provided the inspiration for the throne. 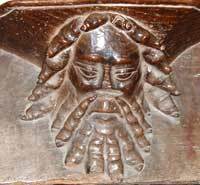 The head of Our Lord is based on the 15th century carved misericord in the sanctuary. The dossall is made of furnishing materials, given by Mrs Bryan Case. These include wool, leather, suede, gold and silver kid, beads, braid, silks and gold and metallic threads. The stitches used Cretan, chain, raised chain band, loop, stem and back stitch. The design is by Isobel Clover and the embroidery by Susan Gurney. The dossal was dedicated on All Saints' Day, 1970. 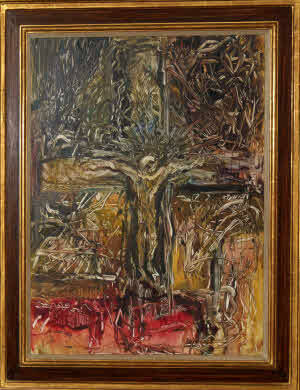 The Crucifixion, painted and presented by Leslie Marr in 1970. Born 14 August 1922, the son of John Lynn Marr at Aykley Heads, on the Northern outskirts of Durham city. Leslie inherited the Baronetcy from his grandfather, Sir James Marr, upon his death on 24 November 1932, but he does not use the title. He was educated at Shrewsbury and Pembroke College, Cambridge. He was a Flight Lieutenant in the Royal Air Force, Technical Branch (Radar) and started painting in Palestine during WW2. After the war he was taught by David Bomberg at the Borough Polytechnic. He became a member and Secretary of the Borough Group, created by Bomberg in 1949, and took part in many of its exhibitions. He married Bomberg's step-daughter, Dinora Mendelson. He has exhibited extensively, including at the R.A., and now lives on the Isle of Arran. Marr had another string to his bow in formula 1 racing, driving his Connaught in national events during 1952-53, before trying his hand against tougher opposition in 1954, when he gained his greatest success in Libre events, placed third in the Glover Trophy, and third in the F2 class in the Aintree 200. By 1955 Marr had taken delivery of a B-Type model, but after the British GP he raced it little until early 1956, when he drove splendidly to finish fourth in the New Zealand GP, after starting from the back of the grid without benefit of practice, and then took third place in the Lady Wigram Trophy at Christchurch.